For sale we have a 2004 54 Renault Clio 1.2 petrol Manual 3door 81 k on the clock Starts and drives perfect Electric windowsClean pre accidnet car Very light damage Aftermarket stereo Recorded as a Cat N Estimated retail value of of £999. Viewing is welcome and recommended, all viewing to be done before the auctions ends. The amount you bid is the amount you pay no haggling once you come to collect the car. I reserve the right to end the auction as the car is being advertised elsewhere. Car to be collected whitin 3 days of auction finishing unless otherwise agreed, cash on collection only. Feel free to ring me on 07742908003 for more information texts will be ignored. The vehicle does not have a v5 the new onwner will have to apply for a new one. 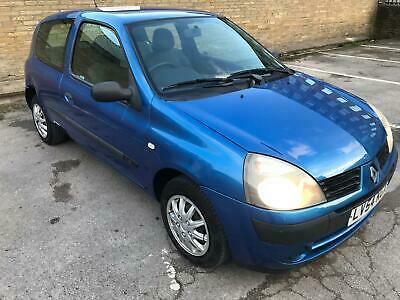 This 2004 54 Renault Clio Authentique 1.2 Petrol Very Light Damage vehicle is located in Halifax, HX1 4BW and the eBay seller is perspective583.